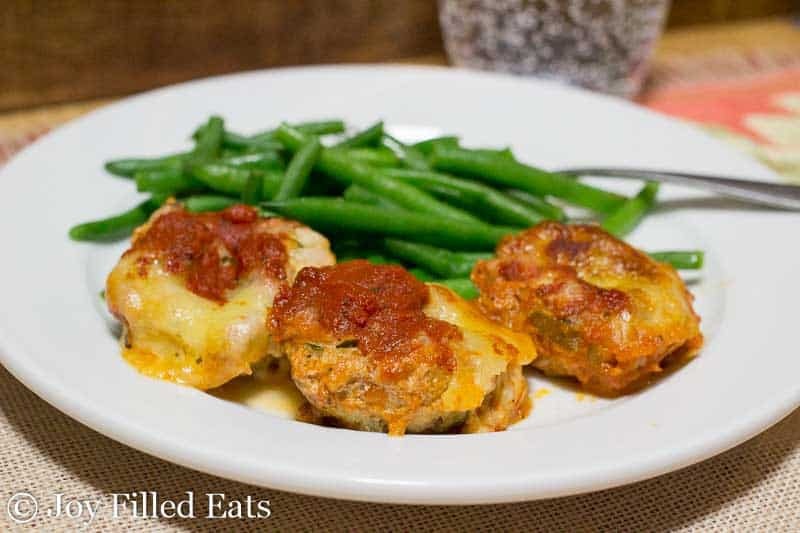 These Mini Mozzarella Stuffed Italian Meatloaf balls are basically big meatballs stuffed with cheese and topped with sauce. They cook faster than a big meatloaf and you don’t need to roll them into balls. They are a perfect weeknight meal. I’m all about easy dinners. This one was very easy. When I was a kid my little brother hated cheese. My mom would always hide it in his meatballs. 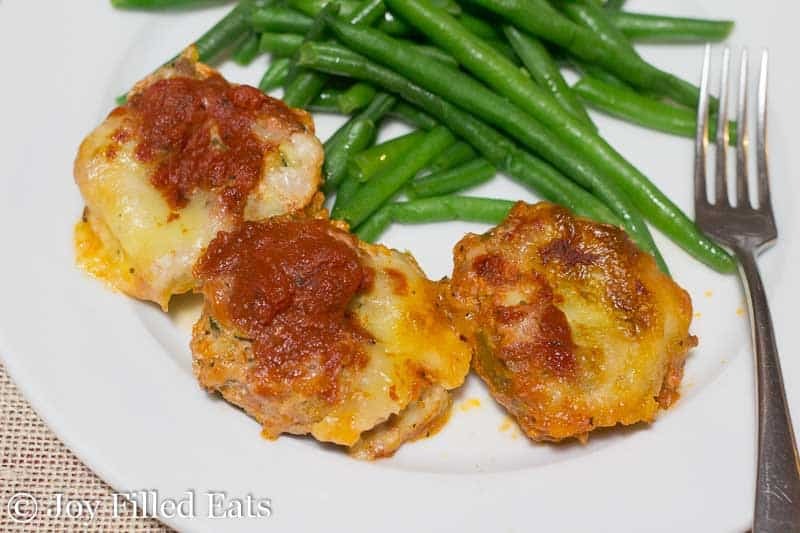 My kids generally like cheese but I’m not above hiding some shredded zucchini in my meatballs and meatloaf. An extra veggie never hurts. 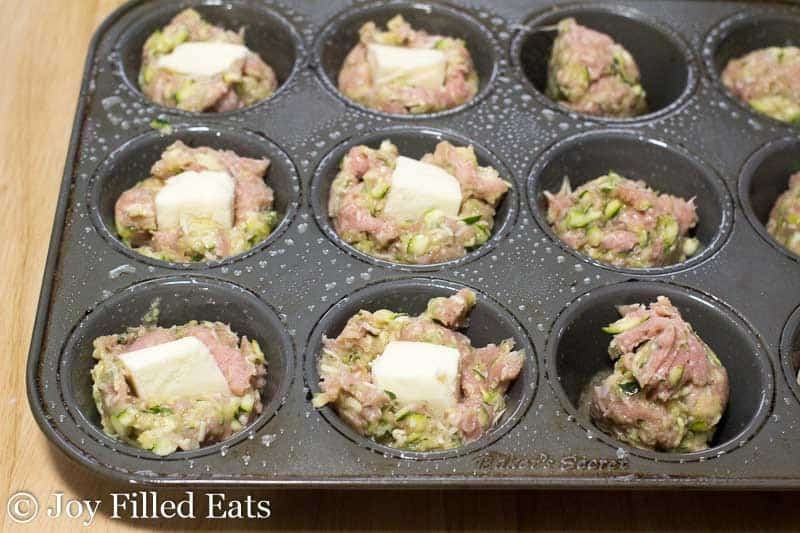 This recipe makes 18 cupcake sized mini meatloaves. We had 3 per adult and 2 per kid. Except for the 10-year-old boy with the adult-sized appetite. He may have eaten 4. He’s growing like a week lately. Last night at dinner we had turkey burgers and he was the only one of all of us to eat 2 entire burgers. And a pile of Caesar salad. And carrots and ranch. After that came dessert. I’m not sure how I’m going to afford to feed him in a few years. 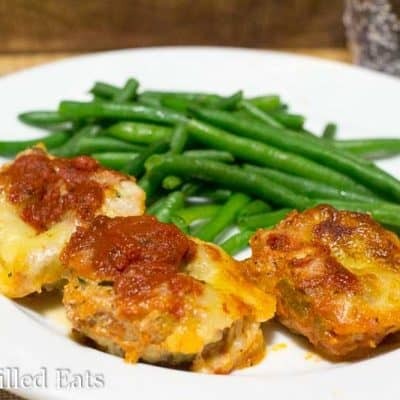 These Mini Mozzarella Stuffed Italian Meatloaves are basically big meatballs stuffed with cheese and topped with sauce. They cook faster than a big meatloaf and you don't need to roll them into balls. They are a perfect weeknight meal. Preheat oven to 400. 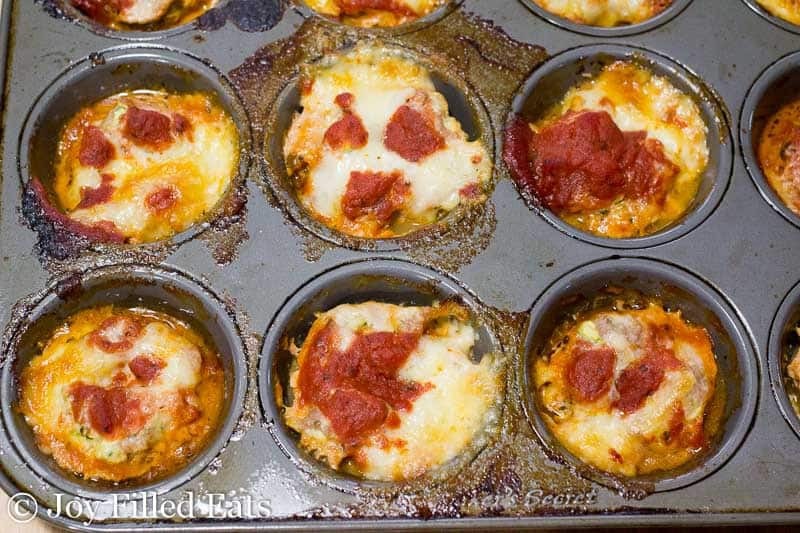 Spray 18 holes of two regular sized muffin tins with cooking spray. Or line with foil liners for easier cleanup and then spray. Stir together meat, grated zucchini, egg, grated cheese, garlic, onion, and salt. Divide the meat between the holes of the prepared muffin tins. Press one cube of mozzarella into each meatloaf. Spoon a little sauce on each. Bake for 30-35 minutes until cooked through. Serve with addition sauce if desired. I’ve been doing keto for a while so I’m always looking for ways to switch it up a little bit. These were delicious! 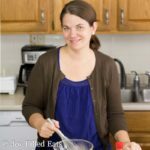 It’s so nice to find a keto friendly recipe that my whole family loves. (I didn’t tell them there was zucchini in it, and they would never know!) My only question is, I know zucchini naturally has a lot of moisture, I even wrung it out a little, but there was still a lot of liquid in the bottom of each muffin tin. Do you try and get out the moisture first or just deal with it? Thanks again! I just ignore the moisture. You could add some coconut flour to absorb it if you want. Made these and they were awesome! I used deer meat cause that was all I had. Loved how the zucchini was hidden in there no one knew it was there. Will be making again for sure. So delicious! I used spinach instead of zucchini and added Italian seasoning to the meat mixture. Next time I will decrease the salt a bit as I found it too salty. Served with green beans and roasted potatoes (for the carb eaters in the family). Will definitely make again! Do you cook the beef before putting these in the oven? No, it cooks in the oven as they bake. Is it ok to leave the zucchini out? Yes, or you could sub in spinach. Yes, they are very similar to meatballs and those always freeze well. Any suggestions instead of Zucchini? Spinach would sub in well. These are on our rotation. Easy. Fun. Yummy. The trifecta of taste! How "big" is a medium zucchini, or, in other words, how much grated zucchini, to you use? About 1 cup of shredded zucchini. I made these for dinner tonight, my whole family loved them!! They're delicious!! Made these for dinner tonight. We loved them. I will make these again! Thank you. I made these last and the were delicious. My husband said I really put my foot in this. Definitely making these again. These were absolutely delicious! Served with cheesy asparagus and my husband said that was a delicious meal I should make over and over! Thank you. You don't even know there's zucchini hidden inside!